"South Park" slammed social networking, and Facebook in particular, during an episode titled "You Have 0 Friends" that aired Wednesday night. During the episode, Cartman and friends become engrossed in interacting on Facebook - adding as many friends as they can and playing with virtual farms. The only one with reservations is Stan, who doesn't want to get "sucked in" to the site and would rather interact with his friends off the computer. But he can't stay away for long. Despite Stan's protests, his friends set up a profile for him anyway. He is forced to add everyone from his classmates to his grandmother to his whining dad, who mopes to his son, "So…we're not friends?" He also has to contend with his girlfriend, Wendy, who accuses Stan of not caring about her because his profile lists his relationship status as "single." The number of Facebook friends each kid has becomes an indicator of his popularity. 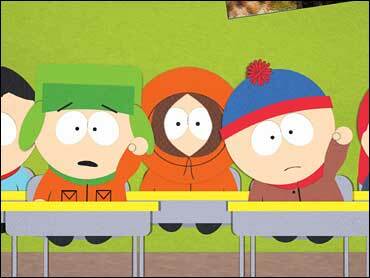 Kyle laments that he doesn't have as many friends as Cartman or Kenny, and wonders why. He becomes even more alarmed when that number begins to decline. But at least he has more Facebook friends than Kip Drordy, a third-grader who has a profile on the site, but (gasp!) zero friends. Kyle adds Kip, and the younger boy rejoices when his Facebook friends go from zero to one. "I made a friend today!" he exclaims to his parents, who assume the new friendship was formed outside cyberspace. When Kyle later decides to remove their Facebook friendship, Kip is back to zero and devastated. All is righted at the end of the episode, when Stan finally deletes his Facebook account and sends all his friends to a gleeful Kip. The episode also took note of the rise of Facebook's popularity among older users of the Web site, such as parents and grandparents, and the overall obsession with games, status updates and constantly sharing information.